While the numbers tuning is far from complete on the WoD beta, it's looking like there's a chance MM is going to come out on top of the hunter specs, with the most possible DPS. There are certainly still a lot of issues with the way MM is set up rotationally, but at this point, it's seeming less and less likely that Blizzard is going to address those things. So, I suppose it's time to start preparing for for the situation where, to be competitive in top tier raiding, we need to play MM. Simply for the reason that hunters haven't had to think about movement for the last several patches, I would imagine that dealing with Marksmanship's Mastery is going to be the biggest change for a lot of hunters. This has an added degree of difficulty, even compared to casters who can't cast on the move, because we don't have less powerful spells to time with movement phases. For example, Boomkins can put up their dots while moving, and then when they get to a place they can stop, use their powerful direct spells. For MM hunters, that won't be the case, because we'll have to stay still for 3 seconds before we the buff goes back up. Another added skill cap we'll need to deal with is "down-time". For all of MoP, no hunter specs have had down time; what I mean by that, is it's currently better to hit the wrong shot, than to delay briefly and hit the right shot. For MM in WoD, that won't be the case. With the various cast times of Steady Shot, Focusing Shot and Aimed Shot, you're going to have times where you've got a GCD or two before Chim Shot comes off CD, but not enough focus to cast and Aimed Shot, and not enough time to cast a Focusing Shot. The solution to both is somewhat related, which is why I wanted to talk about these problems at the same time. The thing is, there are inevitably going to be times when you need to move for more than three seconds. What we'll want to do in this situation, however, is make sure we time our shots accordingly. We have six seconds after we start moving while our mastery buff will still be applied. If you can get stopped again in three seconds, then you're good to go, no need to change your rotation. If, however, you can't, you'll want to time your movement so that six seconds after you've started moving, you're going to need to use steady/focusing shot. These are the shots that will be the least effected by not having the mastery buff, so if you can make sure you're using them, when the buff is down, you can avoid the more substantial dps loss that comes from using Aimed Shot or Chim Shot while the buff isn't up. The other great thing to use while the Sniper Training isn't up is of course, down-time. If you're going to have to skip a GCD anyway, do it while your buff isn't up. That might mean using the empty GCD right after Chim Shot, instead of right before, which will, admittedly, take a great deal of planning and practice. Other, more minimal uses of the down-time / no Sniper Training time could include Tranq Shot or laying down traps or binding shot, and while not likely in raids, perhaps dismissing, healing or rezzing your pet. Hunters have been asking for a way to differentiate really good play from average play, and this is definitely a way to do that, even if we aren't super excited about the way the mechanics are looking. This will mean a lot of planning ahead, and very close tracking of your focus and buffs, but if MM ends up the clear DPS spec of WoD, then mastering Sniper Training will be a significant part of top-end huntering. It will be really interesting to see how close all three specs are. I'd like to see a skill oriented spec like MM do the highest, but not by so great a margin as to feel obligated to play it. I agree with darkbrew, I would like to see a skill related spec award you with higher numbers, but not so much higher. I like the "idea" of marksman the way it is being presented but it is two expansions too late. Hunters are no longer casters and do not abide by their rules any longer. Hunters are now a completely mobile class and should be designed to take advantage of that. They should not become a land locked caster because they are not casters. It is against the entire design of hunters. With that said, all hunter specs are currently skill related specs. Just look at numbers in heavy moment fights and you will see the skilled hunters rise above the rest. To me that is more fun than standing in one place and doing a rotation by the numbers, which is what marksman will be with no bleeds, no procs, and no interactive game play between abilities. Marks id going to need some life if I am going to have to play it all expansion because it is the best because as of now it is a dead boring spec. And this is coming from someone that always loved marks. I don't really want to admit this, because I love MM on live right now so much, but I actually am starting to not hate the WoD version. Some of that is probably just because I've given up hope that they'll fix it, but also, I do think the talents make the spec interesting. If Barrage comes out as the top DPS for that spec, and they continue to nerf TotH so that Steady Focus becomes viable, then it's fairly interesting to play. 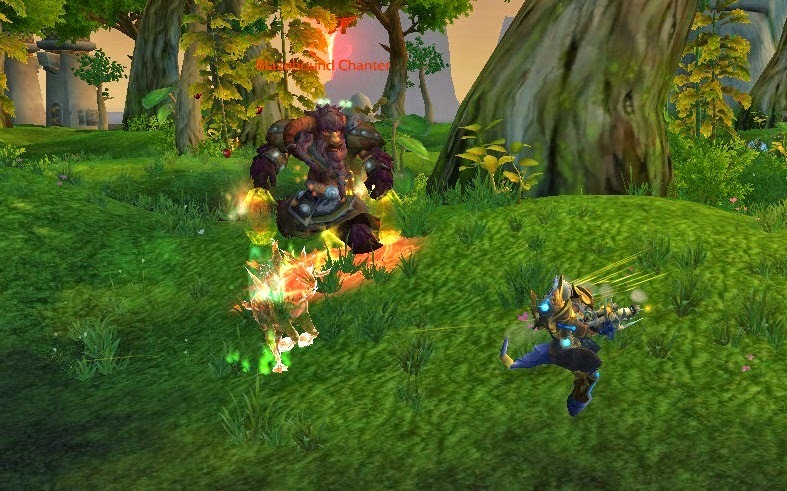 I spent a couple hours in shattrath last night playing with the dummies, and it was, well, not terrible. I mean, I wasn't bored; I had things to think about. However, though I don't have completed numbers yet, I doubt Steady Focus will be competitive, and I'm unsure about barrage. Without those two, we're back to fairly boring. Glaives is so lackluster when it does less damage than your focus dump... and without SF all you have to think about is Sniper Training, which might be a lot on some fights, during the times when you're still, it's not much. I think if they added a haste buff to steady focus, even a small haste buff, it would be much more exciting, and would rival TotH. It is great when you start doing the back flip while jumping back and forth. Even better when you can do it throughout an entire fight and never lose a beat. I actually have fun moving while DPSing to see how well I can handle it. It becomes a challenge all in its own. Hey, this late in the expansion you have to find something to keep yourself interested. But I must admit I do tank on my druid and heal on my druid constantly jumping up and down. So if you ever run across a druid tanking a flex and she never stops jumping even when tanking, that is probably me. I don't mind the mastery so much for MM it is the long cast time shots like aimed, focusing, and even steady. It feels to casterish and not very hunter like to have cast times, even more so amazingly long cast times. That is what gets me most about MM. If I wanted to be a boring caster with every cast being over 2 seconds long I would play a lock and complain about never being able to get a chaos bolt off. Hunters should be firing something every second, seconds and a half at most, otherwise I lose interest and start thinking of what else I should be playing.